Albert Ebosse played club football in Cameroon, Malaysia and Algeria. 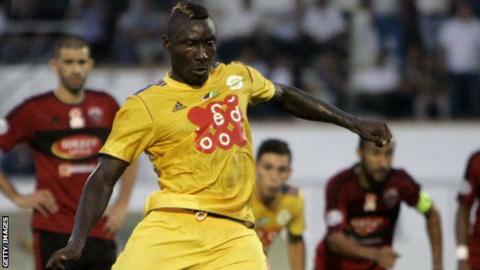 Albert Ebosse's family has had no information from Algerian authorities about how the Cameroonian footballer died, according to their lawyer. Ebosse, 25, died in August after a game for Algerian club side JS Kabylie. Post-mortem tests indicated Ebosse died as a result of a beating, but Algerian sports minister Mohamed Tahmi said his death was caused by missiles from fans. "The family has nothing at all from Algeria," lawyer Jean-Jacques Bertrand told BBC World Service. "That's a problem because the only document we have is the report coming from the pathologist in Cameroon. "The family want to know the truth and maybe the truth isn't as has been said so far. "What we would like is it to have all the documents from Algeria." The original findings into Ebosse's death said the forward died in hospital following a head wound suffered by a thrown projectile. Ebosse's body was sent back to Cameroon, where local pathologist Andre Moune said his injuries could only be explained "by a physical attack". Tahmi this week said Algeria's own investigations showed Ebosse's death was "an unfortunate accident due to missiles being thrown". After Ebosse's death, the Algerian Federation said his family would receive £75,000 compensation. "Yes, some promises were kept, but others were not," said Bertrand. Ebosse's family intend to pursue criminal proceedings and take their case to Fifa, football's world governing body. Bertrand added: "The first fight is to know the truth - the exact truth - for the family, for football, for everyone. "For the fans, for Algeria, for all the people, the truth is the most important thing - it's what we must fight for."